Too bad that Steve Byk’s many fans aren’t able to see him. 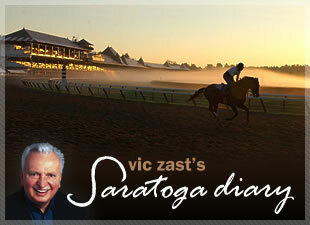 The daily radio voice of horse racing is one of the best dressed men at Saratoga Race Course. He’s on the Beau Brummell list with Cot Campbell, D. Wayne Lukas, Michael Veitch and, of course, Barry Schwartz. Dressed in a subtle plaid tan and charcoal grey sport coat with white shirt and tie and blue-tinted sunglasses, Byk hosted his three hours of “At the Races” on the Sirius Satellite network from the back porch of the Carolina Barbecue Co. stand opposite the north end of the Carousel restaurant. Seth Morrow of Equidaily.com stopped by. As they do every Thursday, Steve Haskin of the Blood-Horse and Rich Eng from Las Vegas called in. Byk has talked it up with trainers Carlos Martin, Dale Romans and Michael Trombetta, the Travers poster artist Greg Montgomery and Hialeah Park speculator Halsey Minor recently. Yesterday, he touted horseplayers on the Pick 4 that paid almost $12,000. Consult www.thoroughbredracingradionetwork.com – the world’s longest Internet address – for a tip from him. Or, if you’d prefer, find the highly sought-after fried dough concession and walk a couple of steps more. You can’t miss seeing the sartorial broadcaster. Because of prevailing conditions, there were 32 scratches and 15 horses entered from the also eligible and main track only lists Thursday. Four races scheduled for the grass were shifted to the main track. Only the jumpers were allowed to feel the green under their feet. The seventh race, a maiden special weight mile, saw five MTOs say yes to the starter. The one named Easy to Say No, a son of Mr. Greeley from the Graham Motion barn, was victorious. In the $79,650 Van Raalte for New York-bred 3-year-olds, the leaders Megapixel, Law Enforcement and Be Bullish held their positions within two lengths of each other through the stretch, ran as a team that way and finished in the same order. There was a fit field of 2-year-olds for the $150,000 Saratoga Special (gr. II), yet Run Away and Hide proved his two wins in Kentucky were legit. Although the Ronny Werner-trained chestnut colt by City Zip might not want anything longer, he got as daring a ride along the rail by Robby Albarado as an owner can hope for. Joe and Pat Palmer of Saratoga Springs celebrated their 53rd wedding anniversary in Section G. Once the 5-3 (Argyle Pink and Selective) came home in the second, they began betting 5-3 exactas, and no more won. In the evening, the celebrants lost out on a dinner at Gotcha’s. There was no room for them at the popular West Side eatery until after their bedtimes. Lastly, imagine the surprise of bicyclists who found a shiny, new bike rack at the grandstand entrance. No more locking up to the chain-link fence. Give another pat on the back to management.